This article is about essential oil isolated from the leaves of the tea tree, Melaleuca alternifolia. For the sweet seasoning oil pressed from Camellia seeds, C. sinensis or C. oleifera, see tea seed oil. Origin of this essential oil, the tea tree, Melaleuca alternifolia. Tea tree plantation, Coraki, New South Wales. Tea tree oil, also known as melaleuca oil or ti tree oil, is an essential oil with a fresh camphoraceous odor and a colour that ranges from pale yellow to nearly colourless and clear. It is derived from the leaves of the tea tree, Melaleuca alternifolia, native to Southeast Queensland and the Northeast coast of New South Wales, Australia. Although there is little evidence of efficacy, it is typically used as a topical medication in low concentrations by folk medicine for attempted treatments of skin conditions. Tea tree oil is claimed as useful for treating dandruff, acne, lice, herpes, insect bites, scabies, and skin fungal or bacterial infections. However, the quality of the evidence for efficacy in these conditions is minimal. Tea tree oil is neither a patented product nor an approved drug, and is poisonous if consumed by mouth. Tea tree oil has been used in traditional medicine in the belief it treats acne, nail fungus, or athlete’s foot, with little evidence to support these uses. In a 2015 Cochrane systematic review, the only trial comparing it to placebo for acne found low-quality evidence of benefit. Tea tree oil is not recommended for treating nail fungus, as it is not effective. It is not recommended for treating head lice in children because its safety has not been established and it could cause skin irritation or allergic reactions. Tea tree oil is poisonous when taken internally. It may cause drowsiness, confusion, hallucinations, coma, unsteadiness, weakness, vomiting, diarrhea, nausea, blood cell abnormalities, and severe rashes. It should be kept away from pets and children. Tea tree oil should not be used in or around the mouth. As a test of toxicity by oral intake, the median lethal dose (LD50) in rats is 1.9–2.4 ml/kg. A 2006 review of the toxicity of tea tree oil concluded that it may be used externally in its diluted form by the majority of individuals without adverse effect (provided oxidation is avoided). Topical application of tea tree oil can cause adverse reactions at high concentration. Adverse effects include skin irritation, allergic contact dermatitis, systemic contact dermatitis, linear immunoglobulin A disease, erythema multiforme like reactions, and systemic hypersensitivity reactions. Allergic reactions may be due to the various oxidation products that are formed by exposure of the oil to light and/or air. Consequently, oxidized tea tree oil should not be used. Tea tree oil is defined by the International Standard ISO 4730 (“Oil of Melaleuca, terpinen-4-ol type”), containing terpinen-4-ol, γ-terpinene, and α-terpinene as about 70% to 90% of whole oil, while ρ-cymene, terpinolene, α-terpineol, and α-pinene collectively account for some 15% of the oil (table, right). The oil has been described as colorless to pale yellow having a fresh, camphor-like smell. Tea tree oil products contain various phytochemicals among which terpinen-4-ol is the major component. Adverse reactions diminish with lower 1,8-cineole content. The name tea tree is used for several plants, mostly from Australia and New Zealand, from the family Myrtaceae, related to the myrtle. The use of the name probably originated from Captain James Cook‘s description of one of these shrubs that he used to make an infusion to drink in place of tea. The commercial tea tree oil industry originated in the 1920s when Arthur Penfold, an Australian, investigated the business potential of a number of native extracted oils; he reported that tea tree oil had promise, as it exhibited antiseptic properties. Tea tree oil was first extracted from Melaleuca alternifolia in Australia, and this species remains the most important commercially. In the 1970s and 1980s, commercial plantations began to produce large quantities of tea tree oil from Melaleuca alternifolia. Many of these plantations are located in New South Wales. 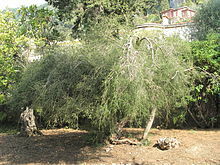 Since the 1970s and 80s, the industry has expanded to include several other species for their extracted oil: Melaleuca armillaris and Melaleuca styphelioides in Tunisia and Egypt; Melaleuca leucadendra in Egypt, Malaysia and Vietnam; Melaleuca acuminata in Tunisia; Melaleuca ericifolia in Egypt; and Melaleuca quinquenervia in the United States. Similar oils can also be produced by water distillation from Melaleuca linariifolia and Melaleuca dissitiflora. Whereas the availability and nonproprietary nature of tea tree oil would make it – if proved effective – particularly well-suited to a disease like scabies that affects poor people disproportionately, those same characteristics diminish corporate interest in its development and validation. In dogs and cats, death or transient signs of toxicity (lasting 2 to 3 days), such as lethargy, weakness, incoordination and muscle tremors, have been reported after external application at high doses. A 2008 article from the American Cancer Society stated that “despite years of use, available clinical evidence does not support the effectiveness of tea tree oil for treating skin problems and infections in humans.” Other uses under preliminary research include applications for nail fungus, dandruff, acne, scabies, and athlete’s foot, but existing evidence is limited. A 2012 review of head lice treatment recommended against the use of tea tree oil on children because it could cause skin irritation or allergic reactions, and because of a lack of knowledge about safety and effectiveness. ^ a b c d e “Essential oil of Melaleuca, terpene-4-ol (tea tree oil): ISO 4730: 2017 (E)”. International Organization for Standardization (ISO), Geneva, Switzerland. 2017. Retrieved 2 February 2019. ^ a b c “Opinion on Tea tree oil” (PDF). SCCP/1155/08 Scientific Committee on Consumer Products. 16 December 2008. ^ a b c d e f g “Tea tree oil”. National Center for Complementary and Integrative Health, US National Institutes of Health. 2011-11-09. Retrieved 30 May 2016. ^ a b c d e f Thomas, J; Carson, C. F; Peterson, G. M; Walton, S. F; Hammer, K. A; Naunton, M; Davey, R. C; Spelman, T; Dettwiller, P; Kyle, G; Cooper, G. M; Baby, K. E (2016). “Therapeutic Potential of Tea Tree Oil for Scabies”. The American Journal of Tropical Medicine and Hygiene (Review). 94 (2): 258–266. doi:10.4269/ajtmh.14-0515. PMC 4751955. PMID 26787146. ^ a b c Pazyar, N; Yaghoobi, R; Bagherani, N; Kazerouni, A (July 2013). “A review of applications of tea tree oil in dermatology”. International Journal of Dermatology. 52 (7): 784–90. doi:10.1111/j.1365-4632.2012.05654.x. PMID 22998411. ^ a b “Tea Tree Oil”. National Capital Poison Center. Retrieved 4 December 2013. ^ “Fungal skin infection – foot” (Clinical Knowledge Summary). UK National Institute for Health and Care Excellence. 2014. Retrieved 16 January 2017. ^ a b c d “Tea tree oil”. Mayo Foundation for Medical Education and Research, Mayo Clinic. 2017. Retrieved 2 December 2017. ^ Cao, H; Yang, G; Wang, Y; Liu, JP; Smith, CA; Luo, H; Liu, Y (19 January 2015). “Complementary therapies for acne vulgaris”. The Cochrane Database of Systematic Reviews. 1: CD009436. doi:10.1002/14651858.CD009436.pub2. PMC 4486007. PMID 25597924. ^ a b Eisenhower, Christine; Farrington, Elizabeth Anne (2012). “Advancements in the Treatment of Head Lice in Pediatrics”. Journal of Pediatric Health Care. 26 (6): 451–61, quiz 462–4. doi:10.1016/j.pedhc.2012.05.004. PMID 23099312. ^ a b c Carson, C. F.; Hammer, K. A.; Riley, T. V. (2006). “Melaleuca alternifolia (Tea Tree) Oil: A Review of Antimicrobial and Other Medicinal Properties”. Clinical Microbiology Reviews. 19 (1): 50–62. doi:10.1128/CMR.19.1.50-62.2006. PMC 1360273. PMID 16418522. ^ a b c Hammer, K; Carson, C; Riley, T; Nielsen, J (2006). “A review of the toxicity of Melaleuca alternifolia (tea tree) oil”. Food and Chemical Toxicology. 44 (5): 616–25. doi:10.1016/j.fct.2005.09.001. PMID 16243420. ^ Aberer, W (January 2008). “Contact allergy and medicinal herbs”. Journal der Deutschen Dermatologischen Gesellschaft = Journal of the German Society of Dermatology : JDDG. 6 (1): 15–24. doi:10.1111/j.1610-0387.2007.06425.x. PMID 17919303. ^ “The Effectiveness and Safety of Australian Tea Tree Oil”. Australian Government – Rural Industries and Development Corporation. Archived from the original on November 1, 2018. Retrieved 26 February 2014. ^ Billee Sharp (18 September 2013). Lemons and Lavender: The Eco Guide to Better Homekeeping. Cleis Press. pp. 43–. ISBN 978-1-936740-11-6. ^ Sávia Perina Portilho Falci (July 2015). “Antimicrobial activity of Melaleuca sp. oil against clinical isolates of antibiotics resistant Staphylococcus aureus”. Acta Cirurgica Brasileira. 30 (7): 401–6. doi:10.1590/S0102-865020150060000005. PMID 26108028. ^ “Tea Tree Oil and Dogs, Tea Tree Oil and Cats”. Petpoisonhelpline.com. Retrieved December 13, 2012. ^ “Tea Tree Oil Toxicity”. Veterinarywatch. Archived from the original on January 11, 2013. Retrieved December 13, 2012. ^ Villar, D; Knight, MJ; Hansen, SR; Buck, WB (April 1994). “Toxicity of melaleuca oil and related essential oils applied topically on dogs and cats”. Veterinary and Human Toxicology. 36 (2): 139–42. PMID 8197716.